On September 5, 1915, the crew of Guichen warship from the 3rd French squadron that patrolled the East Mediterranean noticed huge white flags on the Turkish shore: one with a red cross and another saying “Christians in trouble, please help.” Captain Joseph Brisson ordered to lower the boats and find out what was going on. PanARMENIAN.Net - Some people, who swam from the shore, were taken aboard. Those were Armenians from the coastal villages, who handed Brisson a letter asking for help. Guichen was the last hope for participants of the 53-day heroic Musaler resistance. About a month before Guichen appeared in the sight, on August 2, 1915, thousands of Armenians from the villages in Antakya (now Turkey’s Hatay province bordering on Syria), refused the obey the deportation law. 4300 people climbed Musaler (Musa Mountain, also known as Musa Dagh). Only 500 of them were combatants, with 200-220 old shotguns, 100-150 Greek rifles and some mausers. After several weeks of successful resistance, the strengths and supplies were exhausted, but the Armenians didn’t lose hope and developed rescue plans. A courier was sent to the U.S. consul in Aleppo, but he didn’t reach the destination. Thus, 3 men were constantly on alert, ready to swim towards any ship that approached the shore. Guichen arrived just in time. Armenians have run out of the ammunition. Hearing out the delegates from the coast, captain Brisson sent a wire to the squadron head, admiral Louis Dartige du Fournet, who, in turn, asked the higher authorities for permission to help Armenians. Meanwhile, captain Brisson ordered to open fire on Turkish positions, eliminating a weapons depot in Kebusie village and forcing back the Turkish soldiers who shelled the boats. Brisson gave the Armenians some lead to make bullets and promised to convey the command decision in 8 days. Thus, invigorated resistance participants continued to defend the mountain camp from Turkish attacks. Having received no response to his request, Admiral du Fournet decided to act on his own. On September 8, cruiser Desaix and flagship Jeanne d’Arc approached the shore. The sailors found out the exact number of people to be evacuated and possible ways of withdrawal. The evacuation started on September 12. Mostly women and children, 3000 Armenians were taken aboard of Guichen, Desaix, Foudre, L’Amiral Charner and D’Estrée, which sailed towards the Egyptian Port Said harbor. Guichen has become the symbol of rescue. However, the path of the warship constructed by Ateliers et Chantiers de la Loire at Saint-Nazaire and commissioned in 1898 was not glorious. Two years after the Musaler battles, the ship was partially disarmed and was used as trooper. In November 1916, Guichen transported a Russian expeditionary force to the Salonika Front. 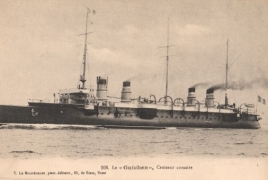 In 1917, Guichen transported some of the Armée d'Orient from Taranto to Bizerte. In 1919, it was sent to the Black Sea as part of the Allied intervention in the Russian Civil War, but suffered a mutiny under command of Charles Tillon, future leader of the Communist Party. In 1921, the ship was retired and broke up. Former Azeri leader "negotiated conflict with Karabakh ex-President" Pashinyan weighed in on the settlement process and maintained that the issue can’t be solved without Karabakh’s involvement.